Roleplay Situations: Conversation Practice ! This activitity sheet lists many different roleplay situations to get your students speaking. Some of the situations are embarrassing or may require them to be persuasive. Good for fluence practice. The present downloadable worksheet is best suited for business/professional students, high school students and adults at Intermediate (B1), Upper-intermediate (B2) and Advanced (C1) level. 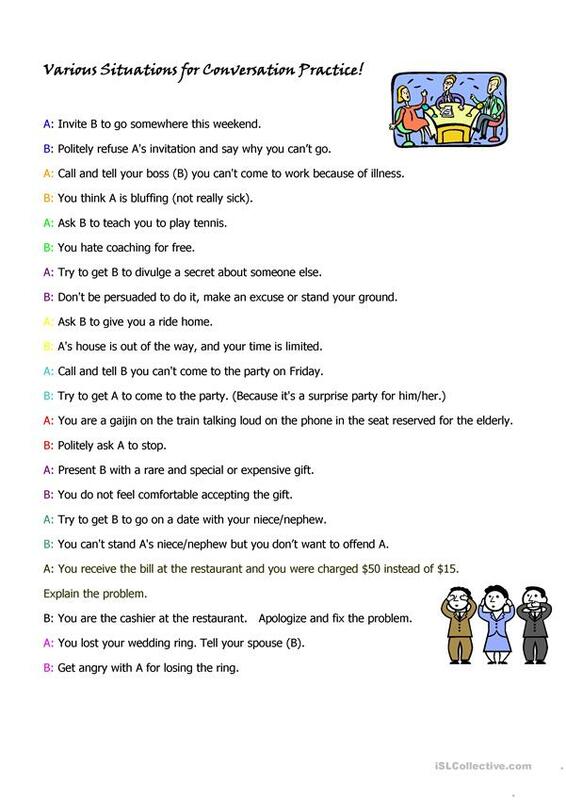 It is useful for honing your class' Speaking skills. crane11 is from/lives in Japan and has been a member of iSLCollective since 2011-06-02 02:00:23. crane11 last logged in on 2014-06-20 10:35:51, and has shared 1 resources on iSLCollective so far.